"You could feel prosperous at the library. There was so much there, such an abundance, when everything else felt scant and ravaged, and you could take any of it home with you for free." While this was particularly true of the Great Depression of which Susan Orlean writes, the same could be said of any time. Libraries represent bastions of democracy, a source for knowledge that is necessary to feed democratic thought, but also a place where diverse people can meet together who otherwise wouldn't. They have inestimable value for this. Librarians try to do so much, offering resources for free, providing help, whether it be to apply for a job or to brush up on the latest knitting techniques. And yet, because they are places where diverse people gather, there is a seamy underside to them. People who work within the library system are well aware of this, particularly the custodial and security staff. Because libraries serve as de facto homeless shelters, a custodian is likely to come across contaminated needles in the bathrooms. Security have to deal with unmedicated people disrupting the tranquil atmosphere. It is necessary, but unpleasant. The Library Book captures this tension among libraries well. Focused on the 1986 inferno of the Los Angeles Library, it details the rich history of the library set against the backdrop of what most certainly was arson. Most people wouldn't burn down libraries. Most people appreciate what rich community resources they are, even those who disrupt them on a daily basis. It is difficult to grapple with someone who would jettison all that they stand for, for what? A moment of fame? A sense of having an impact on the world? Certainly the prime suspect seems to have done it for the attention. Against the lone arsonist, stand the actions of a community that rallied together to support their library. To salvage the books, hundreds of volunteers formed a human chain to move them through the smoky building and out the door. Fish and produce companies donated freezer space so that the books wouldn't grow moldy. Restoring the Central Library was the largest book-drying project ever undertaken with 700,000 books treated. It involved an elaborate process of changing the temperature and pressure of a vacuum chamber. The first batch of 20,000 books treated in this manner drew out six hundred gallons of water! 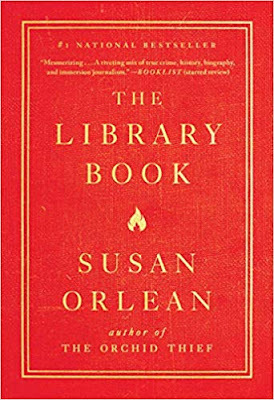 The book doesn't just cover the story of the fire and restoration project, but also a long line of librarians who had the gumption to care. The one who stood out to me the most was Althea Warren who became the head librarian in 1933. 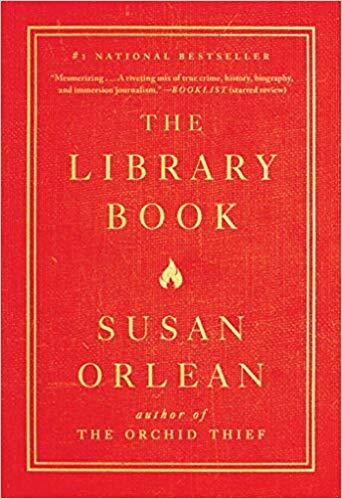 She said librarians should "read as a drunkard drinks or as a bird sings or a cat sleeps or a dog responds to an invitation to go walking, not from conscience or training, but because they'd rather do it than anything else in the world." She encouraged fibbing if it gave you an additional opportunity to read." What I appreciate the most about Orlean's book is the level of detail involved. It wasn't just some of the biographies that burned; it was all biographies of subjects H through K. It wasn't just some charred scrap of paper a witness remembered seeing floating down to the sidewalk; it was from a book called God is Judging You. It makes me want to read another book that is the behind-the-scenes making of this book. This is my favorite line from the book: "Gray paint covering a mahogany wall is not the existential equivalent of the Manson murders or the miseries in a neighborhood like Watts, but they seemed to inhabit the same sour space of things falling apart." I appreciate it because it so well captures what might seem to be a perspective that is difficult to understand. Sure, there are worse tragedies in the world than the gray paint covering a mahogany wall, or in my case, black paint spray-painted over red sandstone, but still, the world is less for it.